Manufacturer: Vauxhall. Inlet Manifold Injectors Flange Gasket. Manufacturer: Vauxhall. Fuel Injector Rail. ORIGINAL Injection computer box OPEL COMBO Box Body / Estate 2008. Condition is Used. Dispatched with Royal Mail 1st Class. COLLECTION FROM NG5. We do our best to answer any inquiry within 24 hrs. BEFORE ORDERING. From a 2015 corsa 1.0L ecoflex 3 cyl petrol turbo. 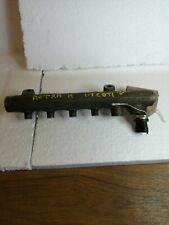 genuine g.m used ( low miles 14,000 ) fuel rail complete with 3 injectors. CORSA C 1,7 DTI. Oil cooler for Opel Corsa C. Opel Corsa C. OIL FILTER HOUSING. As Car Body. At the Nienhaushof 19. Engine code. DE 260194305. Part Number: 25343299. All our parts are genuine! Item Condition. DISTRIBUTION, FUEL INJECTION. GM part number: 55573331. Code letter:, 0445214222. SEALING, INJECTOR, CYLINDER HEAD COVER, SIDE. GM part number: 97185863. 0445214086, 020091L4. Opel Astra H 2007 Kraftstoff-Stamm-Leitung 0445214086 Diesel 66kW GPAC11928. 2007m., manual, 66kw, 1248cc, rhd. Opel Astra H, hatchback. Part Numbers The part is used. Not just a number. All our parts are genuine!and don't forget drive safely! Price: 33 GBP. Reference OE/OEM Number: 0 445 214 095, 0 280 002 706, 0280002706. Part Number: 55 197 370. All our parts are genuine! We will always respond! Item Condition. Part Number: 55 559 375. Injection bar bar injectors rail Vectra C 2,2 16V Z22SE 108KW Opel. [L61] Z22SE ENGINE. Engines:; Z22SE;. Models:; Vectra C;. DISTRIBUTION, FUEL INJECTION. WE MAKE VERSTÄRTKT ORIGINAL A VERY RARE OPEL SPARE PARTS IN THE NEAR FUTURE, SINCE WE A SURPRISINGLY BIG BEARING SPACING COULD! Be sure regularly save it us off and look! We have hired only a small extract from our range. Years, engine2007m., 103kw, 1800cc. The carOpel Vectra C. Warranty on electronic devices is void if identifying mark is removed or has sign of tampering. Exhaust Parts. Body Parts. Looking for used car parts?. Distribution nozzle manifold 2.0 2.3 cdti dci Movano B Vivaro Opel. Models:; Movano B; Vivaro;. INJECTION VALVE - EXHAUST MANIFOLD. DISTRIBUTOR, FUEL INJECTION VALVE. Years, engine2008m., 88kw, 1910cc. The carOpel Astra H. Exhaust Parts. Transmission & Drivetrain. Looking for used car parts?. We have lots of spare parts listed, and about 500 000 spares in the warehouse! Years, engine2010m., 118kw, 2000cc. The carOpel Insignia. Transmission & Drivetrain. An item that has been previously used. Item will be sold as it is shown in the pictures. Part codes0445214199, 55566047. 053203L1, 0445214056, 55200266. Opel Vectra C 2008 Kraftstoff-Stamm-Leitung 053203L1 Diesel 88kW GPAC11547. 2008m., manual, 88kw, 1900cc, rhd. Opel Vectra C, caravan. Warranty on electronic devices is void if identifying mark is removed or has sign of tampering. Models:; Movano A; Vivaro;. DISTRIBUTOR, FUEL INJECTION VALVES. for inquiries: 34375. Code letters:, 0445214024. Storage location: R39 VL 474.58 03/13/2019. J96 1996-2002 VECTRA-B; SENSOR - KLOPFEN BORDER, CYLINDER BLOCK; ENGINE X18XE1 [2 H 9], Z18XE [2 H 9], Z18XEL [L97]. JT98 1998-2009 ASTRA-G ZAFIRA-A; SENSOR - KLOPFEN BORDER, CYLINDER BLOCK; X20XEV [L34] MOTOR. Opel catalog no. : 5817425. FUEL INJECTION VALVE. GM part number: 24420543. Engines:; A10XEP; A12XER; A14XEL; A14XER; Z10XEP; Z12XEP; Z14XEL; Z14XEP;. FOR Y13DT, Z13DT diesel engines. Engines:; Y13DT; Z13DT;. MANIFOLD, FUEL INJECTOR. Storage location: R39 XC104 STF 969.49 15/06/2017. Opel catalogue No. Years, engine2008m., 88kw, 1910cc. The carOpel Astra H. Exhaust Parts. Transmission & Drivetrain. An item that has been previously used. Item will be sold as it is shown in the pictures. Part codes55209572, 0445214095. Part number - 55573331. Model - CORSA D.